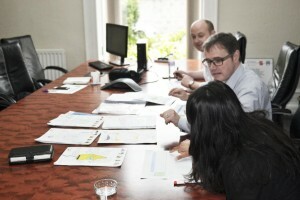 Judging taking place for The Petrex/Skene Square School Education Meets Enterprise Design Competition. Judging Panel: Mr Chris Milner, Chairman of the Society for Underwater Technology (Aberdeen). 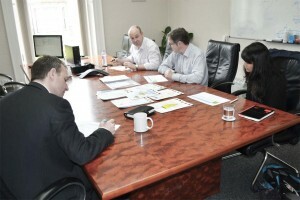 Ms Surrinder Retour, Subsea Controls Engineer, JP Kenny and SUT+. Derek Younie, Senior Project Engineer, Petrex Ltd. Kevin Kit Ho, Subsea Designer, Petrex Ltd. Ian Pithie, Business Manager, Petrex Ltd.